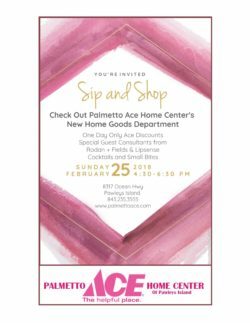 Be sure to save the date for this unique event @ Palmetto Ace Home Center after our normal sotre hours on Sunday, February 25th from 4:30pm-6:30pm. great gifts to give for any occasion. Maybe you have a party you’re attending and you’re in need of a hostess gift. Perhaps a special birthday or anniversary is coming up. Plus, wedding season will be here before you know it. Take advantage of 10% OFF the regularly priced merchandise as our gift to you! We also hope you enjoy meeting Mary with her Rodan + Fields products. Who doesn’t deserve to pamper themselves?! Grab a drink and take some time to peruse! !